From a long time I was looking for an easy input method to type in Hindi which doesn’t require special hardware (Hindi keyboard) or shortcuts which is hard to remember. Here is a very easy solution which will let you type Hindi in any of the applications. Using Google Transliteration IME you will be able to type in your choice of language using a roman keyboard. Users can type a word the way it sounds using Latin characters and Google Transliteration IME will convert the word to its native script. You will require to download and install a small software from [Google Transliteration]. Google Transliteration IME is currently available for 14 different languages -Arabic, Bengali, Farsi (Persian), Greek, Gujarati, Hindi, Kannada, Malayalam, Marathi, Nepali, Punjabi, Tamil, Telugu and Urdu. Just select language of your choice. After downloading and installing the software you will see a small floating IME toolbar at your desktop . This toolbar will let you switch between typing mode Hindi or English. 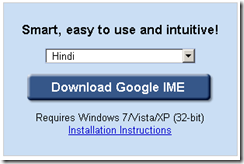 Above are some of the examples where Google Transliteration IME is used to enter text in Hindi language in different applications. Hi.. The google transliteration software rocks. Thank u so much for ur valuable input. Hi! Ive downloaded The Google transliteration, but still havent been to start to type...m kinda lost as in where to start and how...and everytime I click on Googlemarathi icon on my desktop..it shows its downloading again! नंदिनी, just press "left alt+shift" keys together (after you have downloaded the Google transliteration tool....you should see a mini languange toolabar in your status bar...under the desktop) और आप हिंदी में टाइप कर सकते हैं. Press "lest alt+shift key again to switch back to english again.....All the best. Thanks नंदिनी .. your tip is really very convenient and easy to use. mani ye softwere to load kar liya hai per ye chal nahi raha hai ..
बहुत बहुत धन्यवाद. यह में जो लिख रहा हू वो आपकी इस हेल्प से पूरा हो सका हैं . thank you very much for helping out a difficulty for and it is the best way to type in Hindi. vineet-- thanks! its easy 2 use n its helpful.